The aud/usd has been advancing for more than two weeks, but things may change as we had into the 0.9650 resistance. The last time the pair reached this area it spent days (weeks actually) trying to break higher, but just couldn’t pull off the move. The 0.9650 level showed a wall of short orders hitting the market, all at the same time. Thinking that the pair pays a huge swap interest rate, theoretically more then the gbp/yen does, the pair should have been used for the carry trade and have broken higher without any problems. Well, it did not do that and by the magnitude of the short orders in the 0.9650 area, something tells me that a major player was selling. The RBA maybe? The pair is once again approaching the same level, and again volatility can be expected as traders ask canit break and bounce higher? For me, the short side seems to be more likely. As seen in the above chart, the 0.9650 level is the get-together point for two pretty important resistances. In that area, the aussie will meet the 0.9650 resistance together with the upper line of the channel in which the pair traded recently. If we keep our eyes on the recent history, the pair needs very strong momentum to move higher, and withput a major player hitting the market with short orders, it is unlikely that it will find the required strength to advance any further. On Tuesday night, the RBA is scheduled to release their interest rate decision. The market expects the central bank to hold, but at the same time a dovish tone is expected since the recent economic releases point out that the last rate hikes have already sterted to impact the real economy. If we add the recent trend spotted when a major CB release their interest rate decision, buy the rumor sell the news, we obtain one more proof that a turn around may be on the cards. One further argument comes to mind. This week, especially the last trading days, were clearly awful for any dollar bull, and an observation is that usually trends end with the week-end break, the time when traders cash their chips and enjoy some days off (right). This leads to to believe that short aussie, after a failed upside test from these levels is what we will be seeing. The above is my personal breakdown for the week ahead, my little aussie analysis. The only thing left is the market to prove me right, again! Just a while ago the investment world thought they had got rid of the credit crisis and everything was running smoothly, however, it seems as though the crisis just does not want to give up so easily, and now the sub-prime fiasco is now backed by inflation. It looks now as though it is an unstoppable duo, credit and Inflation, for the world economies, but most for all for the U.S. one. The credit crisis keeps consumer away from loans, while at the same time inflation strains their pockets. I have already laid bare my thoughts on oil and commodities, and it seems that more and more analyst share the same opinion: there is still room to run. Having crude oil trading at $140 per barrel, despite the numerous verbal interventions, can be a good reason to say the commodity market may not have ran out of bulls yet. Banks and financial company’s credit ratings have been downgraded, sending down the major market indexes. The S&P is heading towards the low of this year, while the Dow Jones is touching the lowest point since September 2006. European shares saw an imposing sell-off, closing the session more then 2% off, while Asian shares barely closed on the green, after 6 days of continued selling. The problem is now that the tight credit conditions and expensive commodities, translated in $4 gas, are reaching consumer’s pockets. In a recent survey, 7 out of 10 consumers replied that higher gas prices caused them "financial hardship". This is the last thing the US economy needs, consumers that stop spending. Consumers less willing to spend will be immediately be felt in the GDP and growth numbers, dragging down the potential economic development. This a pessimistic scenario. I’m still remaining optimistic on the US economy, especially on US shoppers unique ability to spend. I’m still bearish over the long term on commodities, but probably my dollar view will need some little tweaking to adjust to the new FOMC statement, and on the other various factors. The weekend is near, the time when thoughts are consolidated and trends are broken. Who knows what will hit next week, outside of the ECB and Aussie rate decisions? In the European CPI chart there is something way off. Can you spot it? Some would notice that the red line that rose in the last months was almost vertical. Doesn’t that look like a bubble? An inflation bubble is something unheard off...until now. Fed Funds Futures point to the markets starting to price in a rate increase from the Fed by August. The main component that added to the view of an increase were the U.S. CPI numbers that came in inflationary, bumping the chances of the August meeting outcome for a rate increase to 60%, up from 9% one month ago. At this point in time the markets are seeing a rate increase of 50 basis points as having the same possibility as a 25 basis points rate increase. This is a big shift in policy for the Fed, thinking that just a back in March the Fed cut 75 basis points. The markets have certainly adjusted to the new inflation fighting outlook, having s strong surge of dollar buying after Mr Bernanke adjusted the FOMC stance, and adding that last month's economics signaled to him that the worst of the economic pull-back is behind us. Bonds were immediately sold, dragging the yield on the 10 year treasury bond up to 4.25%, from 3.92% last month. The yield on the two years note, which is the most sensitive to changes in monetary policy, rose 65 basis points in the week, the most since 1982. With treasury yields going up the dollar posted the biggest weekly gain in the last 3 years against the euro and in 4 years against the yen. The euro lost more then 350 pips in the week while the yen posted a similar gain, but in order for the dollar to appreciate further it first has to break the 1.53 area on the euro and the 108 area on the yen. Volatility is expected when the dollar tries to take out these levels. As long as the Fed keeps an eye on inflation the dollar will get bought against most of the major pairs. 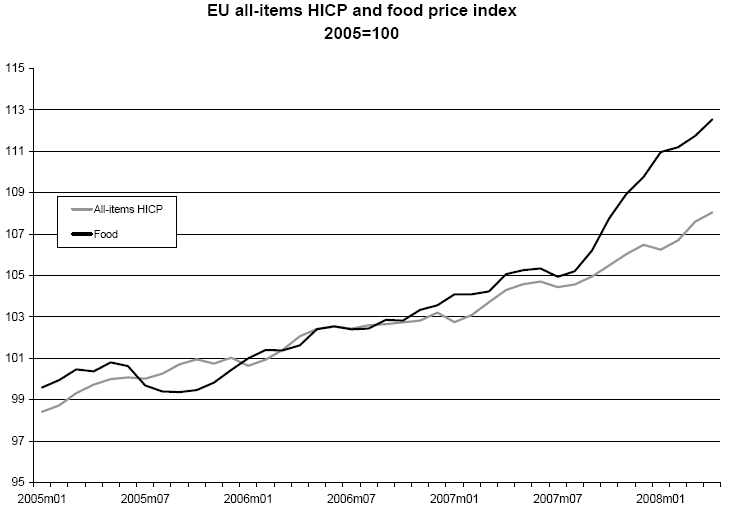 What is needed now is the CPI to catch up reality and actually reflect the higher prices we are dealing every day. Who knows, maybe the greenback days are here, we will have a signal to get long the dollar for more than just a day trade when oil heads towards $120 a barrel and we see GDP growth numbers. The trade team reported two weeks ago that they felt a base was in place on the dollar index at 71.50, the next area topside to break and hold will be 74.00, and once that has been traded around for a few sessions we will be looking for a test of 75.00. All-in-all it looks as though the oversold greenback is attracting trade desk interest, but they will do all they can to keep from signaling the fact that they are buying the Usd. we are seeing a swing point it seems. The retail sales are here, and much better than expected. The numbers were released at 1%, and the previous number also revised up to 0.4% from -0.2. Overall is pretty impressive if we judge that the economy is facing credit strains and consumers are struggling with falling house prices and even more expensive gas. Only one type of business reported a decline from last month, miscellaneous stores retailers, while all others reported gains. The biggest gains were in gas sales and building materials. If higher gas sales aren’t a surprise, since the retail sales release is not adjusted for inflation, the increase in building material sales are a big surprise. Some could call it huge surprise, since most metropolitan US areas reported double digit drops in prices from last year. Building materials are up 2.6% from last month, but overall are still under the last year sales. A good explanation for this phenomenon could be house owners are trying to improve their houses, maybe to recover some of the missing value. It can be seen as a way to hedge the real estate losses. Compared with last year the biggest drop in sales was recorded in the car sales industry. Sales are down over 6%, in a time when high-end luxury cars, like Mercedes, BMW and Porsche recorded a 15% drop from last year, suggesting more and more customers are chosing a Ford rather then a high end car. This can be called a downsize in sales, I think. It’s not clear whether retail sales were helped by the stimulus check-rebates, or by consumers that just like to spend, but it’s clear that retail sales posted an unexpected number. US Equities rose at the time of the news release, while treasuries sold, showing markets are eager for any kind of confirmation that things will get better. Having a consumer that is ready to open their wallet whenever needed means that the US GDP number has every chance of picking up momentum once again, and thus the Fed may have more running to do to tackle the inflation issue, thereby empowering the greenback further. Any dollar appreciation will come with many still looking at the size of the negative trade balance, and as such we are likely to see plenty of pushing and shoving as the markets battle over dollar fair value. The dollar has won this week's battle, only another 30 to go to get to where we were before the sub-prime downgrades hit. • strong determination to secure a firm anchoring of medium and long-term inflation expectations in line with price stability. • The high growth rate in the first quarter might be partly offset in the second. • Euro-system staff macroeconomic projections: 1.5% and 2.1% in 2008 and between 1.0% and 2.0% in 2009. • availability of bank credit to households and non-financial corporations has not been significantly affected by the turmoil. Above all, the most important thing said is the case of hiking rates next meeting, by a small percent. Mr. Trichet said a rate hike is possible, but not certain, and referred to a small percent as inline with what we had before, meaning 25 basis points. This obviously is a first, practically going against the recent trend of cutting rates. Doing this, the ECB wants to reconfirm its goal of maintaining price stability over the medium term (18 to 24 months). It should be noted that the rate hike story comes a month after Mr. Trichet said that rates were in the right place. But at that time, the euro wasn’t in the right place, breaking above the 1.600 resistance. Since Mr. Trichet spoke about the possibility of a rate hike, the eur/usd gained more then 150 pips. It seems the euro may regain the upside momentum once again, but if the HICP release comes in weaker then expected we may see some profit taking. Asked about the commodities prices, Mr. Trichet said at first they were demand driven, but now they are certainly speculative. Another thing that should be noted is that Mr. Trichet made a subtle reference to“Inflation risk comes from market segments with low competition, such as parts of the services sector”. Mr. Trichet has said this line for some time, but there was something new here by saying “parts of the services sector”. Usually references to the financial sector point out to the financials. I wonder if the ECB and EU are cooking something for themselves here. The clarity is a refreshing thing, the timing is strange, but out of it all we, as forex traders, know that the market's fair value on the Eur/Usd is around 1.5600. Traders may now want to plot their paths from that pivotal point. Whether you see it as Long or Short, overbought or oversold, it makes no difference, there will be trades both sides of it, but just keep that number in mind and monitor how far away from it the speculative interest can take this. Another Central Bank intervention, or simpler Jawboning, is cooking at the Fed–ECB doors. Mr. Bernanke said in a video-conference at the International Monetary Conference in Barcelona, Spain, that he is "attentive" to the implications of the currency's decline, that the FOMC will "carefully monitor developments in foreign exchange markets" and are aware of the effect of the dollar's decline on inflation and price expectations. At least they acknowledge the dollar decline has an influence over inflation that affects not only the U.S., but mostly the whole world. This attempt to influence currency markets through jawboning is the second in less then two moths, after Mr. Trichet intervened in the market when the euro broke the 1.60 barrier. The euro fell 700 pips as a consequence of Mr. Trichet saying he and John Pierre Roth at the Swiss National Bank, support the strong dollar, and another ECB Council member saying rates need to be cut(yeah, with inflation at 3.6%?). Now we have got the second part of the intervention, having Mr. Bernanke saying the US Dollar's value is now being closely watched. I have no doubt about it; everyone is looking at the dollar and especially how much value it lost in the last three years. The printing presses are working hard, one might assume, pumping out Notes and Treasuries. It will be interesting to see how the currency will react now, given that in the next few days the ECB interest rate decision will hit the wires. I’m pretty sure inflation will be the main event, followed by "growth still in the potential output", "uncertainty in the financial markets had been diminished", "strong money supply growth". All of the familiar stuff. The thing is that overall the ECB press conference usually sounds somehow bullish on the Euro economy, and this was seen today in the strong GDP release. A stronger business cycle leads to a stronger currency, and it seems markets know this pretty well. Back to the charts, the 1.5300 area, where the 100-day moving average sits, could act as a strong support, given the fact that the euro had already retraced in that area, and bounce higher. Furthermore, always keep an eye on the euro in that it is the biggest of all the major pairs that make up the Dollar Index. The fair value number on the Eur/Usd is at 1.5500, by 09:00 EDT Thursday that may have changed, and if the ECB are still fighting inflation the dollar may need more than jawboning to get it through 74.00 on the Dollar Index, and under 1.5300 against the Euro. It may come, but maybe once oil and gold have dropped 20%, and housing has found a bottom. The trend on the euro is still Long, we'll respect that. If you purchased American International Group, Inc., (“AIG”) common stock or certain AIG or AIG-affiliated fixed-income securities between February 8, 2001 and March 31, 2005, you may be eligible for compensation. “The United States Securities and Commission (the “Commission”) filed a complaint in this action on February 9, 2006, alleging that from at least 2000 until 2005, AIG materially falsified its financial statements through a variety of sham transactions and entities and that AIG reported materially false and misleading information about its financial condition. On February 17, 2006, the United States District Court for the Southern District of New York (the “Court”) entered a Final Judgment against AIG, to which AIG consented without admitting or denying the allegations of the Complaint. Pursuant to the Final Judgment on March 3, 2006, AIG paid a total of $800 million ($700 million in disgorgement and a civil penalty of $100 million) to the Clerk of the Court. The funds were thereafter deposited in an interest-bearing account with the Court Registry Investment System (“CRIS”). In an order of June 14, 2007, the Court authorized the Commission to establish a Fair Fund in accordance with Section 308(a) of the Sarbanes-Oxley Act. The Fair Fund includes all of the funds in the CRIS account established in this action and any other amounts subsequently paid into that account. The Court’s order also appointed Kenneth R. Feinberg as Distribution Agent to prepare and propose to the Court a plan of distribution for the Fair Fund. The Court approved the Distribution Plan on April 14, 2008”. This is funny, a financial company that changed its financial statement. Probably all financial companies should be sued for this. Some time ago, there was a minor indignity where Hedge Funds reported leverage data to appear bigger. No serious actions were taken at that time, so what did the AIG do to actually get a fine? AIG only had to deliberately release a bigger balance book to get this fine, bigger with $2.7 billion or a 3.3%. This is quite interesting for me. I wonder if the SEC will take any measures against the sub-prime originator. At least AIG acted outside the law’s short arm, but Merrill Lynch & Co., Citigroup Inc. and four other U.S. financial companies dodged balance sheet rules with laws introduced last year, to increase the book value of $12 billion of revenues from bonds who’s price had declined; it is legal too if anyone asks. Basically, the financial companies issued bonds, let say, for example, worth $1000. After the sub-prime saga began, their bonds started to get sold, because investors saw them as over-valuated (actually as a worthless paper). As the bond prices went down the financial companies said they owed less money, and so, if the bond’s value dropped to $600, they would still book a profit of $400. In this fantasy world they would still owe $1000, but $600 is the current market value of their debt. Nice pull guys, I really like your creativity and ingenuity since you were the ones to lobby last year for the law that makes all this possible.